CAIRO, Aug 3 (Aswat Masriya) Around 2500 Egyptians have been evacuated from conflict-torn Libya to Tunisia in order to be flown back to Egypt, the country’s foreign minister said in a press conference during his visit to Tunisia. Sameh Shokri is visiting Tunisia today to oversee the evacuation of Egyptians from Libya. He said the prime minister has given orders to different state authorities to secure the swift return of Egyptian nationals and to ease the pressure on the Tunisian authorities. “We do not have clear statistics of the Egyptians who are still stranded in Libya,” Shokri said, explaining that the number ranges from 5,000 to 10,000. EgyptAir, the national carrier, set up an emergency airlift between the Djerba airport in Tunisia and the Cairo international airport on Thursday to transfer Egyptians fleeing the Libya conflict. Shokri said that some logistical problems with organising flights delayed the evacuation process. He met Tunisian Prime Minister Mehdi Jomaa during his visit on Monday. He is scheduled to visit the Djerba airport and the Ras Jdir border crossing, where Egyptians cross over from Libya. Egypt’s armed forces provided Egyptians at the border crossing with 5000 meals, as per President Abdel Fattah al-Sisi’s orders. The foreign minister commended the efforts of the Tunisian authorities in evacuating Egyptians from Libya, stressing that cooperation between both states is ongoing. “We do not want, by any means, to negatively affect Tunisia’s national security,” he said, equating the importance of Tunisia’s security to Egypt’s. Shokri said there is no current talk on the possibility of an Egyptian army intervention in Libya. “The army’s role is to preserve the safety and security of the state and protect its borders,” he said. Deadly fighting between rival militants in Libya has been reigning over the capital and the eastern city of Bengazi for over three weeks, with over 200 killed. An Egyptian woman was shot dead inside her home by mistake during clashes in Libya’s city of Benghazi on Thursday. 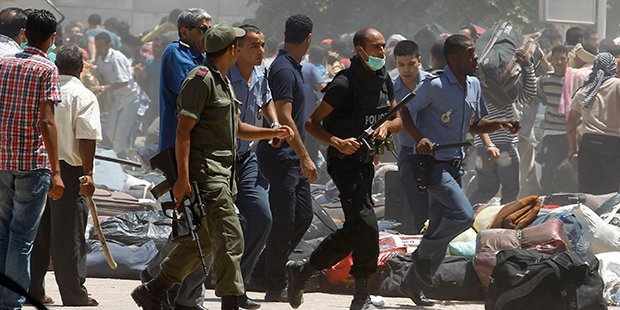 Around 24 Egyptian workers were also killed in Tripoli when a rocket fell on their home last week.